As you prepare for hosting friends and family this holiday season, put some thought into your home's comfort by installing a heating system that can best accommodate multiple temperature preferences. Most people are only familiar with the traditional, ducted heating system, where one thermostat controls the temperature of the entire house. 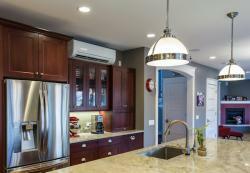 However, the lesser known ductless HVAC systems have emerged more recently as the most efficient way to heat and cool individual rooms or living spaces. Mitsubishi Electric systems allow you to establish multiple heating zones; they can be comprised of a single room or set of rooms. Give holiday guests comfort with the flexibility that these zoning systems allow. Keep the kitchen at a cooler temperature as you are cooking dinner, while turning up the heat in the living room where the grandparents and kids are at. Have overnight visitors? A ductless system in the guest room is the best way to ensure a comfortable stay.